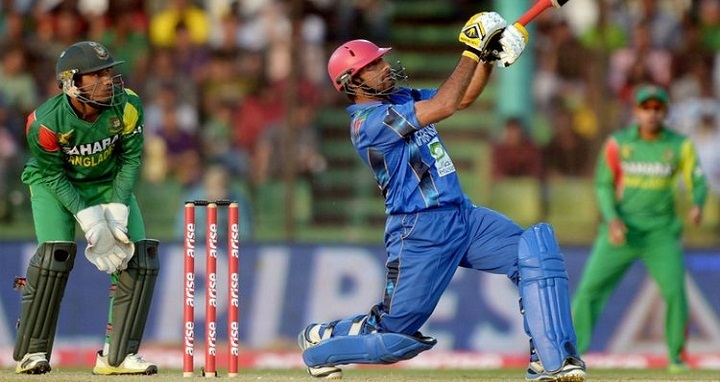 Dhaka, 4 June, Abnews: Amazing performances by Afghan pacers Shapoor Zadran and Rashid Khan thrashed Bangladesh by 45 runs in the first T20 match at Rajiv Gandhi International Cricket Stadium in Dehradun, India on Sunday. The bowling attack by Afghan players took six quick wickets and limited Bangladesh to 122 runs after the batsmen had put up 167 in 20 overs. Chasing 168 runs target, Bangladesh lost their opener Tamim Iqbal in the very first ball of the innings. Bangladesh’s other opener Liton Das went for his shots, hammering 30 off 20 balls while Mahmudullah Riyad was the second highest scorer for the team, with 29. Afghanistan player Rashid Khan got man-of-the-match award for his outstanding 3 wickets for 13 runs only. The second match of the T20 series will be held on Tuesday.